High performance for wireless use: the area imager Granite 1911i from Honeywell makes it possible. Wherever you need it – for production, warehousing, logistics – it gives its all 100% anywhere. The case is so robust that it withstands numerous drops of up to 2 m without damage – even on a concrete floor. The Granite 1911i is also effectively protected against the penetration of water, dust and other foreign matter, and has IP65 certificate protection. Top reading performance and reliable barcode scanning is ensured by the strong scan engine with Adaptus Imaging 6.0 technology inside. Honeywell has installed in the Granite series the same engine that is also embedded in the best in its class area imager Xenon 1900. The Granite 1911i reads barcodes of all kinds quickly and reliably: this of course includes 1D, 2D and PDF codes, as well as damaged or difficult to read barcodes. The imager captures linear 20-mil codes even from a distance of more than 50 cm. 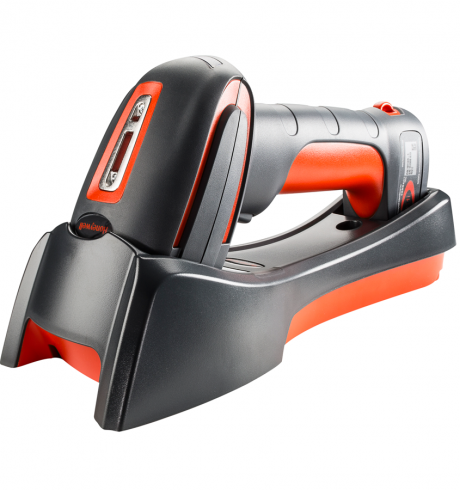 Speed up the process with the cordless imager: thanks to Bluetooth Class 1, data transmission works smoothly within a range up to 100 meters. Employees can thus move freely around the work area and can be assigned flexibly. A battery charge lasts for up to 14 hours or 50,000 scans – whether at -30 ° C or +50 ° C. If the battery is empty, replace it easily and without tools in a matter of seconds. The scan confirmation occurs both visually and audibly by default, via a lit LED and a programmable beeper. For particularly noisy or poorly lit environments, you can optionally equip the Granite 1911i with a vibration feedback. The scanner then vibrates after a good scan, leaving no doubt. Thus, you increase efficiency and avoid a multiple scanning of the same barcode. To work more cost effectively, easily operate up to seven Granite imagers with a single base station. You will conserve budget funds without having to make compromises. Another practical item is the paging feature, which significantly facilitates finding misplaced scanners. The scanning software Remote MasterMind simplifies network integration for administrators.